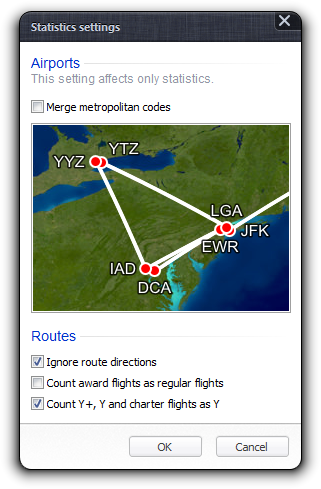 Flightmap offers a sophisticated statistic analysis of your itineraries, including filters. Please note that statistics are due for an extensive overhaul—we're planning something great here for future releases! The settings dialog offers some general settings that are stored in the Windows registry on a per-user basis. There are three checkboxes below that: when “Merge route directions” is checked, the direction of all flight routes are ignored, i.e. DUS-FRA will be treated as identical to FRA-DUS. Otherwise, both directions will be counted separately. “Merge award and revenue flights” does not keep separate track of award flights, and “Merge Y+, Y and charter flights” will treat all those classes of travel as Economy. The “Statistics” command opens a new window. 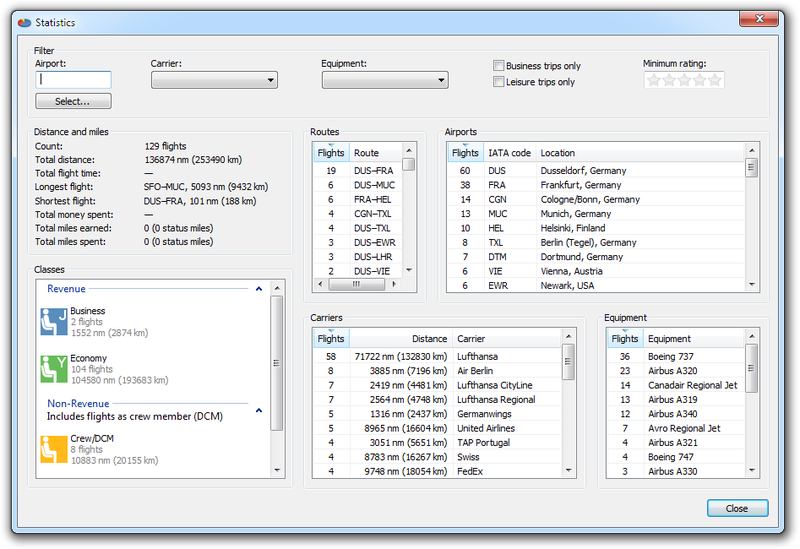 The small upper part contains some filter settings, the large lower part displays the statistic analysis of all flights that pass the filter settings above. The filter pane allows you to filter all flights from your itinerary in regard to “Airport” (either as origin or destination), “Carrier”, “Equipment”, “Business” and/or “Leisure trip”, and your “Minimum rating”. The dropdown lists contain all carriers and types of equipment from your itinerary. A flight has to meet all parameters to get included. After changing a filter setting, all statistics get automatically recalculated. The large statistics are presents information in different areas and lists. A summary of your flight contains the flight count, the total distance travelled, the longest and shortest flights, and the number of frequent flyer miles earned and spent. The list beneath the summary splits your flights in regard to the class of travel: First Class, Business Class, Economy Classes, and Crew/DCM. Flightmap displays the number of flights and total distance travelled for each class. Depending on your settings, award flights may be displayed separately in the “Non-Revenue” section. The remainder of the window contains 4 lists that display the most frequent used “Routes”, “Carriers”, “Airports” and “Equipment” types. Please note that statistics are limited to a maximum of 10 flights unless you have purchased a license key.